Here is another comic I tracked down on eBay after seeing a cover image on Tumblr. Like Man-Gods from Beyond the Stars this one dates from 1975, when I was buying a lot of Marvel comics. However, it’s another case of “faux nostalgia”, since it isn’t one I owned at the time (in fact I don’t recall seeing any issues of Arrgh! before). As it turns out, the cover (by Alfredo Alcala) is by far the best thing about the comic – not just for the layout, but for the promise of an intriguing “Bigfoot-hunting” scenario. 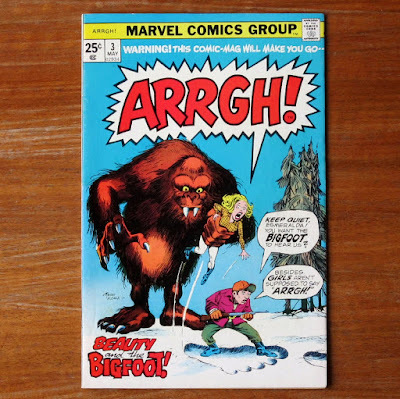 Unfortunately the cover bears very little relation to the interior story – “Beauty and the Bigfoot”, written by Don Glut and drawn by Mike Sekowsky (as you can see from the sample below, the setting and characters – and artistic style – are completely different). The story (just 7 pages long) is a slight one, about a Bigfoot falling in love with a human female. The latter, despite already being married, quite enjoys the situation. While the set-up has distinct possibilities, the Comics Code stamp on the cover means that Bigfoot has to keep his trousers on (probably the only time you’ll ever see Bigfoot wearing trousers, in fact). The only positive thing I can say about “Beauty and the Bigfoot” is that it’s better than the other two stories in the comic (“Rat Reborn” and “The Mummy Walks” – the latter being a recycled political satire from the 1950s that wouldn’t have made much sense in 1975, let alone now). I still think it’s a great cover, though. Funnily enough, Andrew, I don't recall seeing an issue of Arrgh! 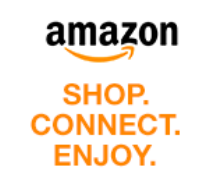 either, except possibly in an ad. That is a great cover - Alfredo Alcala was one of the best. When he took over Swamp Thing back in the '70s, a lot of people didn't immediately notice that Berni Wrightson was gone. Thanks Kid. The fact that it's a cents copy (rather than pence) and I bought it from a UK seller suggests that perhaps this title was never on general distribution here. At the time I did regularly buy imported comics from the Andromeda bookshop in Birmingham, but I think they only imported the really popular titles.